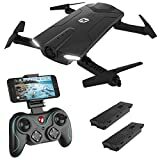 The Holy Stone HS160 Shadow FPV Camera Drone has been on sale on Amazon for quite some time now, and you know what? We’ll keep covering it as long as it is. We’ve gotten a ton of great feedback from readers who have jumped on this sale, which gets you a great camera drone with a foldable form factor for just $89.99 after you clip the $10 on-site coupon. You typically need to spend at least twice that much to get a drone with the features you’ll find on this model, including one-touch take off and landing modes. Definitely check it out if you haven’t already.